The final book in the Cryptid Hunters series will be out October 1st. It’s called MUTATION. 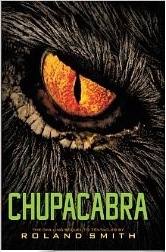 I have been a fan of this series since the first installament “Cryptid Hunters.” I just recently finished reading “Chupacabra” and am really excited for the fourth and final novel “Mutation.” You are a great author and everything you write about I always pick up at my bookstore. Keep up the great work Roland Smith! If you keep reading I promise to keep writing. The 4th and final Cryptid book, MUTATION, will be out in October. I LOVE the Cryptid Hunters series!!! Will Mutation be the last book or will there be more? You should really have a movie made for the books! MUTATION will be the last. Marty and Grace move on off camera and I move onto other books. pleeeease make more books and movies in the series!!!!!!!!!!!! i am only 11 and love all of your books you even came to my school findley elementary you autographed my copy os CHUPACABRA!!!!!! I love your books at the start the summer I thought ill sit around and do nothing then I discover a magic world called CRYPTID HUNTERS and Marty and Grace helped me through this summer at my low times and high thank you Roland for all your help. I have read almost all your book. I am 9 years old and I think your books are amazing. I have just read all three cryptid books again while I wait to get Mutation. I had to order it in our local bookshop. I think they would make brilliant films. Hey Roland I just want to say I enjoyed the entire series right to the end. I think this would make a great movie! I’ve read or I’m going to read all your books. I’ve enjoyed plenty of your books! Thanks so much for the great adventures! This book was awesome! It was so adventurous,and the best part was when Grace and Dylan went in the woods to find Luther. i loved your the cryptid hunter series i’m sad there will be no more made i got your newest book two months after it came out your books have made me go deeper in my hobby of cryptozoology. i may only be in high school but i have big dreams and your book are very inspiring. i really loved the cryptid hunters and tentecles and then chupacabra came out in my local library and i loved it too, i liked that they got Grace back and that they got a hilarious revenge on yvonne. i honestly think the books are great beyond all measures. What plot structure did you use in Chupacabra? I am doing a book talk and that is a part of it. I hope you do like it!